As obsessed over your air fryer as I am? 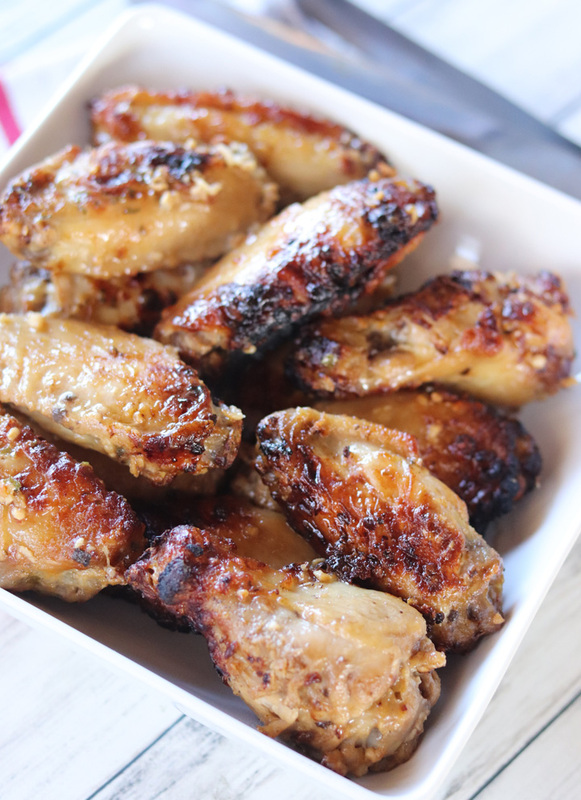 These Air Fryer Garlic Parmesan Chicken Wings are super easy and incredibly delicious! Full of great garlic flavor and crisped to perfection in your favorite air fryer, you will gobble these right up. I am obsessed with my Air Fryer. So is my son. He loves how quick and easy it is to make some of his most favorite treats. They come out fried to perfection, with little to no oil. My son considers himself a bit of a chicken wing connoisseur. He’s maybe even a little bit wing crazy. He’d eat them daily if I made them daily. His favorites are Garlic Parmesan and Lemon Pepper. So a couple of afternoon’s ago, we decided to whip up these easy Air Fryer Garlic Parmesan Chicken Wings. I think my favorite part of having an Air Fryer is literally the ability to make a “fried” snack fast . And still have it be full of flavor and moist and delicious inside, while the outside is crisp to perfection. Chicken is especially amazing to cook in the Air Fryer and we’ve done just about every style you can imagine from drumsticks, to thighs, breasts to nuggets. 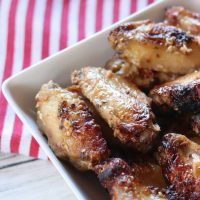 I made these Air Fryer Garlic Parmesan Chicken Wings in batches to help the air circulate better and I recommend doing that. It adds just a little more time to the process but it turns out a perfectly crisp, yet juicy chicken wing. 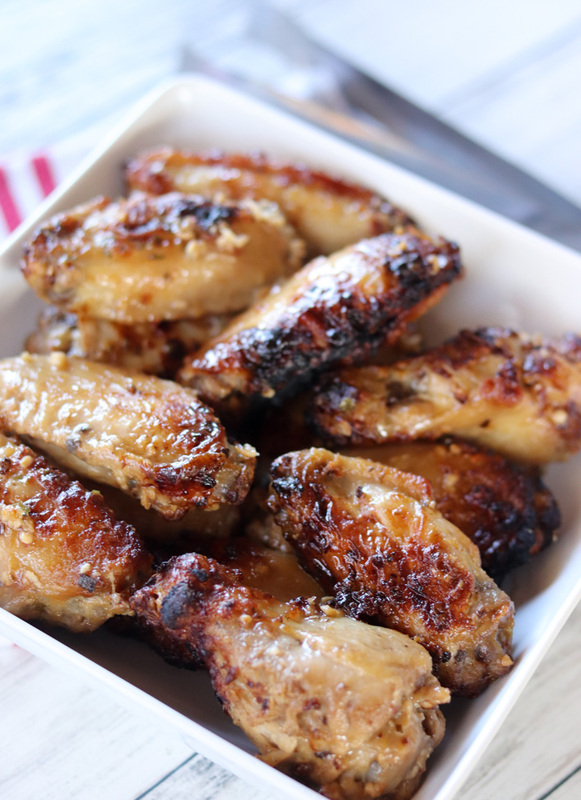 Don’t have any air fryer and still want to make these Air Fryer Garlic Parmesan Chicken Wings? You can. They can be oven baked but they won’t crisp up. They’ll still taste delicious though. Also if you don’t have an air fryer, this is the one I have. I absolutely love it. I have the digital version, I can’t say anything about the manual with the dials. We’ve made fried chicken, burgers, fries, taquitos, egg rolls, bacon and more. There are dozens of versions and varieties of Air Fryer’s and the only thing I have learned across the board, is that they don’t all work the same way. They also don’t always cook the same way. So with that said, these Air Fryer Garlic Parmesan Chicken Wings were made with the Magic Chef XL Air Fryer 5.6 Qt. That is what they were tested in several times and so the times and temperatures were for this specific model. 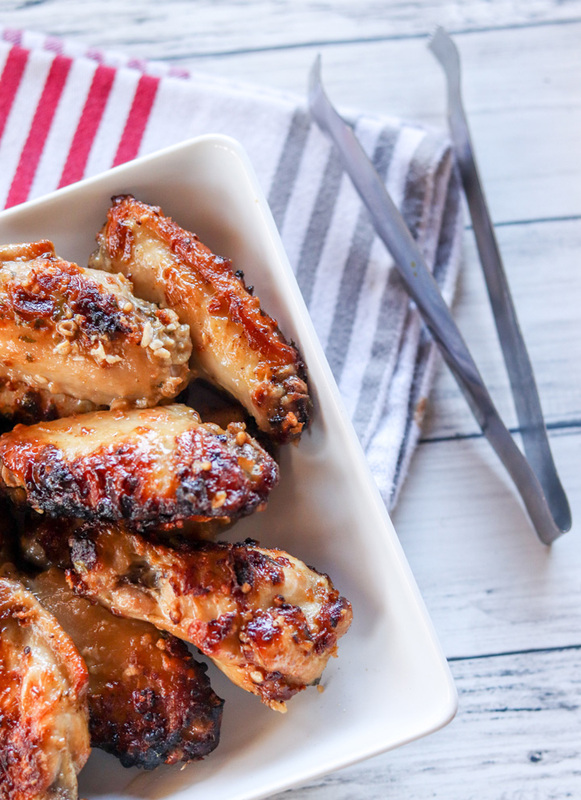 Who’s ready to make these awesome Air Fryer Garlic Parmesan Chicken Wings? In a large bowl, blend together the salt, pepper, garlic, paprika, Parmesan cheese and melted butter. Toss the wings in the sauce to get an even coating all over each wing. Toss several times to coat. 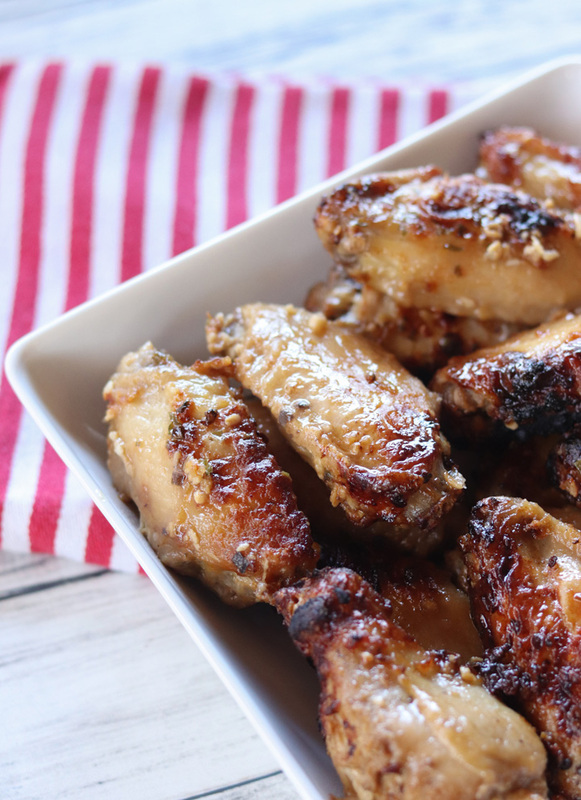 Place the chicken wings inside your Air Fryer basket. Don't overcrowd the wings too much. I do about 1lb at a time. In my opinion it's best to do in batches so the air can circulate around the wings as much as possible. Just makes for a better crisp. Some people just put them all in there, but I have had better results in two batches. 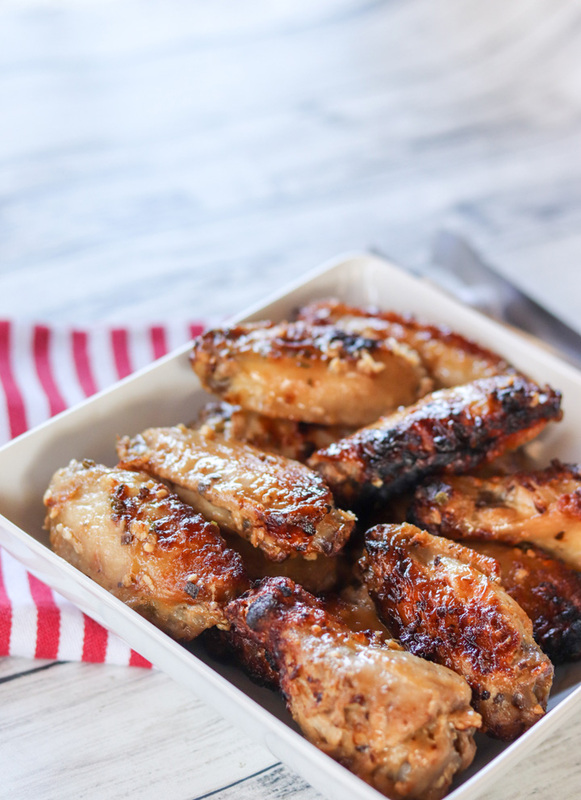 Set the air fryer temperature to 380 degrees F.
Press start and allow chicken wings to cook for full 20 minutes. However, about every 5 minutes remove the basket, shake the chicken to keep the wings cooking evenly. After 20 minutes, toss the wings one last time and remove immediately. Be careful, hot! Enjoy and serve with your favorite sauce, or simply as is.